Material Supply Only. Post in-ground only. 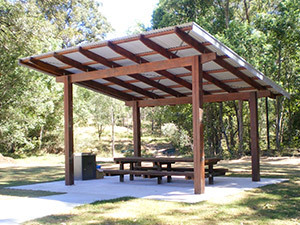 The simple lean-to arrangement of the Lindsay makes this the most economical of the ‘Explorer series’ park shelters. Using a large 190x45mm rafter allows basically an extra metre overhang over the Gregory (gable) or Hume (hip) models. 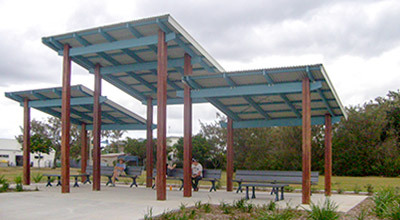 The standard Lindsay Park Shelter sizes are 5m × 6m, 6m × 6m, and 10m × 6m. 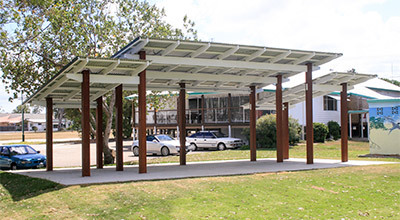 Posts are our Pioneer™ Post › The design life of the Pioneer™ Post embedded directly in the ground in SE Queensland is 35 years. This is probably longer than steel.